After Robert Kirkman and Lorenzo De Felici immersed fans into another fantasy world with the debut last month of Image Comics' 'Oblivion Song' #1, issue two promises to provide more details with a character-driven chapter. One of Robert Kirkman's strengths as a writer is finding the humanity amid the madness. It's not about the zombies in 'The Walking Dead,' it's about the survivors dealing with each other and the monsters found within each of them. 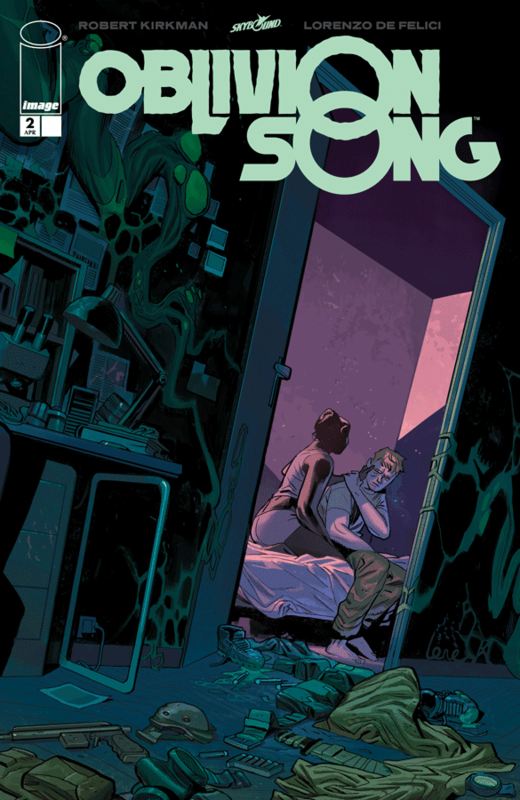 'Song' is very much the obsession of Nathan to rescue people still trapped inside Oblivion, the interdimensional world that descended on Philadelphia ten years earlier and stole hundreds of thousands of its citizens. While his goal may be in earnest, no one is blinded by the fact that he's really searching for his brother Edward. How this all happened is explained in issue two. Kirkman cleverly provides an expositional platform to tell the history of Oblivion by having Nathan give the recently rescued Crenshaws a tour of the memorial museum of the incident. Here, we learn how sudden and devasting the event was and what it took to quarantine the area. It reads a lot like what the history of 9/11 is and so it rings true that such a catastrophe would have a monument to the event and its heroes and victims. Kirkman fleshes out the backstory perfectly giving Nathan even more motivation to return to Oblivion with the knowledge the Crenshaws shared with him. Naturally, an event such as this with so many casualties and people missing for years, survivors are left to wonder, to assume their loved ones are essentially dead and move on with their lives. When some of them come back, complications arise when old loves have to contend with their partner's new loves. Those conflicts arise in this issue and it's the type of subplot that adds plenty of drama but one that seems entirely realistic given the circumstances. Kirkman's knack for examining human nature under extraordinary situations fuels the plot development without depending solely on the grander spectacle of rampaging Oblivion monsters. De Felici and colorist Annalisa Leoni create a stunning array of images depicting the real world and Oblivion. As perfectly executed an issue in layouts, character designs, and pacing, the story lies in the well-worn faces of the characters. Haggard, weary, worried, conflicted, concerned, angry it's all there in the lines of people's faces. De Felici conveys the tone and mood of Kirman's script with resounding accuracy and emotional heft. Leoni compliments those moments with subtle warm colors. It's not easy to describe the level of artistic mastery this art team is displaying. 'Oblivion Song' is a story made for the long haul, an involving drama that should be soaked-in month after month. It's about people facing tragedy and the consequences of that tragedy. The monsters are for show, the characters are for the plot. No one does that better than Kirkman. This is a season-long drama that can't be binge-watched over a weekend. 'Song' is an evolving dystopian fantasy built on pain and obsession, a gripping tale that is just getting started. This is a must-buy.